Experience an unforgettable voyage on board a traditional Holland America Line ship. Premium ocean cruising since 1873. Founded in 1893, the Holland America Line was originally a shipping company and passenger line known for transporting goods and people between Europe and the Americas. Today, it is a household name in luxury cruising, and its ships sail to every continent. You won’t find any surprises onboard a Holland America ship. This industry leader among cruise lines is devoted to providing a classic, comfortable cruise experience. Holland America ships carry on beloved cruise traditions such as ballroom dancing and afternoon tea, and their entertainment options cater to the tastes of refined adults. Expect to find art collections, piano bars and a variety of fine dining options onboard. The vintage décor will make you feel like you stepped back in time to the golden age of ocean liners – without sacrificing the comforts of modern times. Though the cruise line specializes in traditional sailing, it’s kept up with the times. Expanded entertainment options and digital innovations such as the Holland America Line Navigator allow for a more personalized cruise experience, and the introduction of a children’s program and the BBC Earth Experiences make Holland America cruises something the whole family can enjoy. Enjoy a world-class cruise on this stylish ship. With an expansive art collection, maritime antiques displayed onboard, and a traditional Dutch design, you'll feel like a first-class passenger on a classic ocean liner from history. Enjoy an unforgettable cruise to Europe or South America with the ms Rotterdam. Fine dining, an elegant atmosphere and staterooms designed with your comfort in mind are just some of the many benefits that await. The smallest ship in the Holland America Line fleet, the ms Prinsendam offers intimate voyages to every corner of the Earth. Despite its small size, the ship features six onboard restaurants, two onboard theaters, and a number of wine and cocktail bars. The luxurious ms Eurodam can carry you to some of the most beautiful destinations on Earth. Take it easy in comfortable cabins, enjoy excellent culinary specialties and explore breathtaking landscapes. With a garden-themed decor throughout the ship, the ms Volendam provides the perfect combination of earth and sea. Enjoy fresh floral arrangements, nature-inspired artwork, and onboard entertainment related to the natural world. The ms Zaandam is a classic, mid-sized ship offering relaxing, intimate voyages to exotic destinations all around the globe. From Alaska to Antarctica, Boston to the Bahamas, this is the perfect ship for an unforgettable vacation. The ms Noordam sails all around the Pacific Ocean, from Alaska and Hawaii to Australia and New Zealand. Enjoy fine dining featuring regional cuisine, extensive entertainment and enrichment programs, and a casual, relaxing cruise environment. Designed in a classic, ocean-liner style, the ms Niuew Amsterdam offers elegant journeys to popular destinations in the Caribbean, Panama Canal and Alaska. Enjoy a traditional cruise vacation featuring gourmet dining, low-key entertainment, and a calm, relaxing onboard atmosphere. Enjoy a relaxing cruise with the ms Oosterdam. With fine culinary options, hands-on digital workshops, and three different entertainment venues, the ship caters towards an audience of sophisticated adults. The ms Maasdam offers traditional, elegant cruise vacations to families and seniors alike. With hands-on culinary workshops, educational BBC entertainment programs, and gourmet cuisine inspired by the cruise destinations, a vacation on the ms Maasdam is sure to be unforgettable. Come aboard ms Zuiderdam for a dream cruise with incredible cuisine, a multifaceted entertainment programme, and a wonderfully comfortable ambiance that will help you relax like never before. One of Holland America Line's newest and largest ships, the ms Koningsdam sails from Fort Lauderdale to popular destinations in the Caribbean. With a sleek, modern design, innovative facilities and wider variety of dining options, the ship brings a breath of fresh air to an otherwise traditional cruise line. Your cruise aboard ms Westerdam will be a one-of-a-kind experience. Highlights on board include a varied entertainment programme, luxurious furnishings, delicious cuisine, among many others. Launched in December 2018, the ms Nieuw Statendam joined her sister ship, the ms Koningsdam, as the largest and most modern ships in the Holland America Line fleet. The Holland America Line, based in Seattle, is an American/British owned cruise operator. Originating in the Netherlands, the company has been one of the leading providers of cruises to dreamlike destinations around the globe. Holland America Cruises is an established cruise line offering genuine luxury in the cruising industry operating more than 500 sailings a year visiting all seven continents. Holland America Line has a fleet of 15 modern classic ships that offer a perfect balance between a formal and relaxed ambiance. If you are looking for some of the most spacious and comfortable ships at sea, award-winning service, exquisite dining and compelling worldwide itineraries, maybe you shouldn’t look any further. Each Holland America ship is a destination itself. With a wide range of wonderful amenities and delightful diversions you will marvel as your life becomes richer in ways both large and small. From the moment you step aboard MS Westerdam or MS Eurodam you will recognize the Holland America Line difference. Aside comfortable and modern accommodations, spa and fitness, each ship offers delicious specialty dining such as Master Chef’s Table Pop Up or Sel de Mer, an intimate seafood brasserie. Rotterdam class ship MS Amsterdam is known for its generous amount of personal space. Relax and rejuvenate in a thermal pool and lounge of the Greenhouse Spa & Salon. 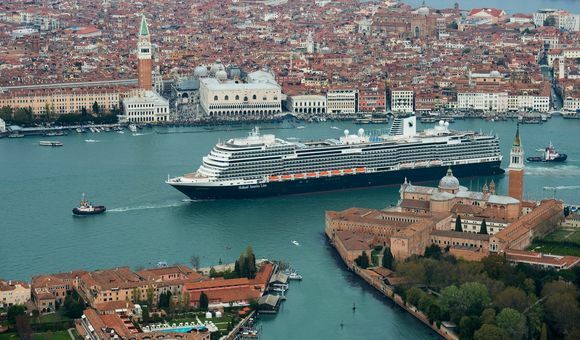 Why cruise with Holland America Line? Holland America Line has been taking its passengers on once-in-a-lifetime journeys around the world for decades. Experience the wild beauty of Alaska, discover unique charms of the Caribbean islands or imagine endless expanses of white sand beaches in Mexico. Choose to sail the world’s waters with Holland America Line and there is no end to the incredible places you must visit and explore. For more information on cruising with Holland America Line, call one of our cruise experts on 1-888-403-1425.